Well, they're probably not American cookies, per se. But the whole culinary experience has been American-ish. First off, I had a 'mad' craving for summit sweet after dinner – but horror of horrors: no decent chocolate in the house. What to do? I suddenly came up with the idea that I would make raw cookie dough. Them US peeps seem to be crazy about the stuff, and actually buy it in packs ready-to-eat, so I thought it must be worth a go – especially as I have all the ingredients in the house from ‘Īd-cookies/" target="_blank">last week. Top Chef Google found me an egg-less, choc chip recipe. However, I didn't have any choc chips, so I added chocolate sprinkles (insert laugh here), and a generous pouring of hundreds and thousands, for added crunch factor. It looked okay, and tasted okay, but after a few nibbles I realized that I was not going to be able to eat much more. I actually felt a little nauseous later on (don't tell mum that; she warned me eating raw dough would be a bad idea). So after that failed kitchen experiment (results: Americans are weird), I then decided to go all out, and just bake some darn cookies! I added some self-raising flour and a couple of egg yolks, rolled it out, cut some shapes, and shoved the lot in the oven for 10 minutes, et voila: biccies that didn't taste all that bad, māshā’Allāh. My parents were pleased, alhamdulillah, (and no doubt surprised that I pulled it off without making a big fuss). But I, being my own worst enemy, found them a tad too sweet. 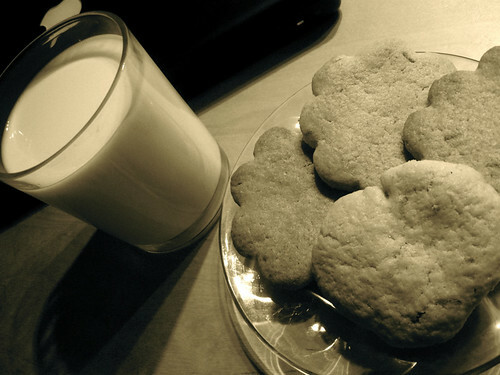 So, to finish off the whole American tribute, I prepared myself a plate of cookies, with a side of milk – finally, a US treat that agrees with me! Instructions: Mix ingredients in a bowl, leave the dough to set in the fridge for a few minutes, roll it out (3-5mm thick), make whatever shapes you please, bake in 200oC oven for just under 10 minutes (depending on how brown you like them), leave to cool, then eat! eww to raw cookie dough! Very nice. Americans aren’t weird, we are just funny and fat. We like our food raw or cooked, so long as it’s edible. Enjoy and send me some! I am actually enjoying these cookies more than the Eid ones. I think cuz of higher butter: flour ratio. Biccies are much softer. Hence: yummier! Masha’Allah. And these ones are all MINE, muwahahaha! (And parents’, ahem).